RYH has workbooks that are designed for use in small groups, covering such areas as family of origin, grieving, forgiveness, understanding emotions and shame. The healing power of a group is a beneficial adjunct to individual counseling. A group helps people realize they are not alone in their experiences and feelings. Offering small group experiences is an excellent way to expand your practice. It is a benefit to the community and an efficient use of your counseling hours. Frequently, a RYH group experience prepares a person for more intensive individual counseling. Are you ready to begin a group now? RYH Processing Pain Starter Kit provides you with all you need to get rolling! What is Restoring Your Heart? RYH is a process that helps people become aware of how the hurts from their past have affected their present, learn how to grieve over those hurts and come to a place of full forgiveness. How does the RYH process happen? RYH happens in a small group experience that is lead by a trained facilitator who guides the group through a workbook especially designed to encourage self awareness and emotional healing. What types of workbooks does RYH offer? RYH has three workbooks. Processing Pain (which deals with family of origin issues), Understanding Emotions and Conquering Shame. The first two workbooks listed have a grieving and forgiveness component. How long are the workbooks? Each workbook is 17-18 weeks. There is one lesson per week, which the participants prepare in advance, and come prepared to discuss and share in the group session. What is the cost of a RYH workbook? Each of the RYH workbooks sell for $30. They are available for purchase on our website. What is a RYH Starter Kit? A RYH Processing Pain Starter Kit contains everything you need to begin a RYH group. A Leader’s Edition of the Processing Pain workbook, six Participant’s Editions of the Processing Pain workbook, a copy of How Emotional Problems Develop, and a laminated Feelings Wheel/Needs Square tool. What is the cost of a RYH Starter Kit? The kit sells for $199. It is available for sale on our website. Can I charge my clients a fee for participating in a RYH group that I lead? Yes, a group is an efficient way to increase your revenue. How do I begin using RYH as a tool to help my clients? We recommend first reading How Emotional Problems Develop, a free download on our website. 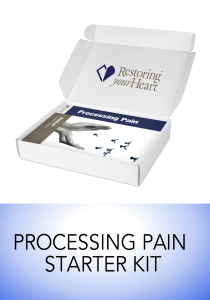 Then purchase a RYH Processing Pain Starter Kit and begin a group. Does RYH have other resources that could be helpful to my practice? Yes, RYH has two other workbooks that are designed for use in a small group, Understanding Emotions and Conquering Shame. In addition, there is RYH Training Manual which contains helpful information from both a Biblical perspective and an emotional/relational perspective. Is there a way to preview the RYH materials before purchasing them? Yes, there is a Table of Contents and a sample lesson from each workbook that can be viewed by clicking the icon for each product on our web store.